In my book ‘Business Kamasutra: From Persuasion to Pleasure’, I talk about it. I call it “Date Before You Mate”. Consent and trust. These are the whole premise to information first marketing. So, there are many pieces you need to have to create a successful information first system. 1. Identify who you are (your business) AND who you are FOR (your ideal customer). Before you can determine who you are FOR, you must figure out who YOU ARE. Simon Sinek wrote a book called ‘Start with Why’. I urge you to read it. It is an amazing framework for soul searching a business. In that book, he talks about how Apple differentiated itself from the competition. Define who you are, define what you are, and define why you are. This is NOT your unique selling proposition. It is much more divine, much more spiritual, much deeper than your USP. This is not how to sell someone on you. It is for you to shape how you want to be seen, for what you believe in… How do you perceive you, your business and your company? What is your DNA? Do you have a value proposition? What are your core values? Can you see what winning looks like to you? What can you do for your clients that makes a meaningful impact? When you have determined who YOU are, then you must decide on who you are FOR. There should be an element of common sense to figuring this out. If you wouldn’t do business with them except for the payday, you probably are not right for them. Who is your ideal consumer for what you do? If you are a dentist, who is your ideal patient? Is it an elderly couple who wants to get a pair of dentures? Or is it a 27-year-old mom who needs to come in with her twins to see if they need braces? eLaunchers’ FOR is that Parthiv and his team specialize in helping businesses scale up their growth and achieve greater profits using engaging direct marketing campaigns that are automated. Our ideal clients range from well-known, high profile direct marketers to local dentists, orthodontists, attorneys and financial advisors. Because Parthiv is a life long learner he always stays on top of the best of ‘what works now’ to bring his clients the best of time-tested old school marketing and technological advances. He does, however, expect that clients be a part of the journey, have the means, resources and fortitude to stay the course with him for 1000 days. He won’t guarantee your ROI, but he does guarantee you’ll be happy. Anyone who understands how humans behave in a business-to-business relationship or a business-to consumer relationship can position themselves in front of an opportunity in a meaningful way. If you show up in the right way, at the right place, at the right time, you will win the prospect over. Let your prospect get to know, like and trust you before you even begin to start a conversation about becoming a client, patient or customer. Your goal should be to become a friend. A trusted advisor. Magnetic Marketing talks about show up with a gift, be a welcome guest, not an annoying pest and share before you sell. eLaunchers goes all out with their Wow Box that is sent to prospects, clients and referral partners. It has a shock and awe package, a workbook, some gifts and knickknacks, and books Parthiv wants you to read. It is highly personalized. He handwrites a note on the inside of the box. This box goes into a priority mail box and then the entire box is delivered to you. Message here is, spare no expense. Show up like no one else. You spend a ton of money to get them to raise their hand. Between first contact and final decision time, it is game on. Do everything you can, roll the dice and go all out to make yourself show up in a category of one. 4. Share before you sell. 5. Become a trusted advisor and add value. The goal is to transform yourself and your business into the new trusted advisor. Become the person or place that adds value and makes it easier for them to grow their business / live their life / reduce embarrassment / increase their profitability or whatever it is that your ideal client, patient, or customer seeks. When you make that transition to become the person that someone calls first when they have a need and don’t know where to turn, you will know that you have succeeded. However, there is a caveat: You have to be sincere. If at any time the prospect has an inkling that your motives are less than pure, you will blow it. And, because of the modus operandi that Info-First Marketing entails, it becomes nearly impossible to get a second chance. 6. Convert, close, deliver and wow. Conversion, if you’ve done everything properly up to this point, should almost be automatic. In many cases, your prospect will actually approach you to go forward and buy! But in the event that they don’t, all you need to do is ask. They’ve now told you where they’re at now and what you need to do to get them to say yes to your offer. At this point, closing is as easy as having your paperwork ready to go so that you can introduce your contract, form, or whatever else it is that you use to get a new customer, patient, or client started. Delivery is one of the things that a lot of companies overlook. They assume that once the sale is made, it’s all over. Accordingly, they spend no time onboarding the client to make sure that the delivery process goes well and that the client, customer, or patient sees immediate benefit from choosing you to do business with. Executed flawlessly, an exceptional onboarding process means that your client will stay around for years, consuming your product or service, over and over again! Obviously, the biggest secret about doing this right is that you will stand out from all your competitors, allowing you to ethically “swipe” their patients, clients and customers! All because you created a “WOW! !” experience that is so powerful, it makes it nearly impossible for your clients, patients or customers to NOT talk about you. 7. Build relationships and ask for referrals. The hidden benefit of having a intimate knowledge AND an unbreakable bond with your customer at “the close”, is that it makes for a VERY strong relationship. A relationship that you can leverage for even more growth. Leverage is your ability to ask for, and get, referrals. For the vast majority of businesses owners, virtually all referrals come organically. These business owners do absolutely nothing to request referrals or get additional business. And that’s a shame. Comparatively, if you’ve done an amazing job to this point, from providing timely, relevant information to making the order process easy and a painless, “blow-them-away” delivery process, a systemized referral system that’s not left to chance will provide you with a nearly endless flow of qualified new prospects. All it takes is some planning foresight, and having a clear end goal in mind before you start building your sales and marketing process. 8. Build a system that does it all! At eLaunchers we have a system called Marketing Department in A Box. It is based on the teachings of Dan Kennedy in his program called Magnetic Marketing. We’ll go through what the program is, then explain the system in detail. But what is “Magnetic Marketing”, really?? 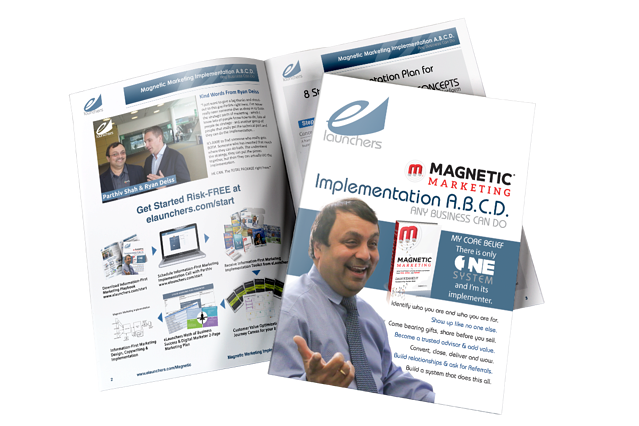 Magnetic Marketing is a system that over 94,000 people have purchased and used in over 16 countries. It has helped change lives. Hundred thousand businesses, millions of people, billions of dollars depend on magnetic marketing. There are seven steps of Magnetic Marketing and when applied right, your marketing execution and strategy is going to improve. 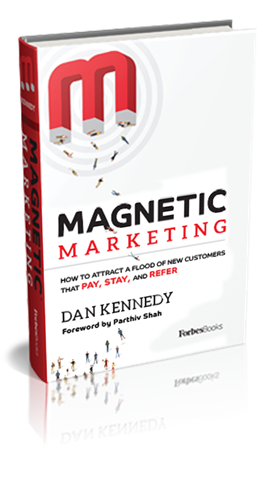 Coming out later in 2018; the book ‘Magnetic Marketing’, by Dan Kennedy with a forward written by eLauncher’s Parthiv Shah. In this book he talks about these seven steps. So, let’s dive right in. Now, this is important. You have to know who you are, who you are for, how you want to please them, how they want to be pleased and, most important, you know that you can please them that way and you’re okay with the paycheck that comes with pleasing them that way. That is Magnetic Marketing segmentation. Now we know who you are and who you are for; how are you going to approach them? Are they direct mail kind of people, are they TV kind of people, can you reach them on radio, can you reach them on online, can you reach them on multiple channels to persuade them to do something with you? On approach, what are you going to say? Magnetic Marketing teaches you how you can come up with your opening line or a message. Any copywriter who has studied Magnetic Marketing or direct-response copywriting should be able to help you develop your opening line, your opening message. Once you have their attention you can go into the next thing. Kennedy talks about show up like a welcome guest, not like an annoying pest. If all you want to do is come in and grab their money, they will repel you. Show up with a gift and share before you sell. Have an offer that they can’t refuse. Give them something of substance and value. That will start a conversation. I paid money to get it but you can have it for free and I’ll even pay for FedEx. Make sure there is always a way for prospects and clients to reply to your offers and that you capture all the contact information they are willing to part with. One way is called a landing page. It’s a form that when you fill it out, the data goes into a CRM software system and it puts you on a list so that I can communicate with you. If it is a call in, be sure you or your staff are using a form so you capture the right information needed in a consistent manner every time. 6. Multi-Step short term Follow Up. Provide stories to help explain all the reasons to decide to use your solution above all others for the problem you can correct for the prospect. It’s called a New Lead Sequence. 7. Maintenance Follow Up, also known as Long Term Nurture. You stay in touch with them with email, postcard, newsletter, phone calls, carrier pigeon, smoke signals or all of it combined until they buy (OR tell you to buzz off). Step seven in Info-First Marketing relates to this part. Here’s an infographic of all the elements of eLaunchers Marketing Department In A Box. Good rule. At eLaunchers, we do that with Databox. Databox is a data visualization tool that both data from all different data points; your Infusionsoft CRM, your Google Analytics, your Facebook, your Facebook ads, Google Pay Per Click dashboard, your QuickBooks, your HubSpot, any place that you have measurable KPI data flying through your life. If you have your dashboard, that goes on your dashboard website, on a large big screen TV in your office so you can see what’s going on, what’s working, what’s not working. It goes on an app on your mobile device. It goes on your wearable watch – your Samsung or Apple watch. But fundamentally, you are measuring your marketing effectiveness and how much money you’re spending. How many leads you are generating, how many leads are converting and how much money you’re making by the day, by the week, by the month. That is Databox. That is the FIRST and literally the last part of eLaunchers marketing department in a box. Second, is the Magnetic Marketing book. This is the book mentioned above that Dan Kennedy wrote, and that Forbes Books published. When I was invited to write a Foreword in the book, I was honored. After all, Dan Kennedy wrote foreword in my book 'Business Kamasutra'. There is a Magnetic Marketing Math worksheet. I recorded an entire video just for Magnetic Marketing Math. (Click this link to watch the video). There is a little brochure that explains the concept, an Excel spreadsheet that you download and it’s an entire workbook on how to measure what’s working and what is not working. Magnetic Marketing Math worksheet is part of the complete Magnetic Marketing system you would buy directly from No BS Inner Circle. Click here to download and read a letter from Dan Kennedy. This is your publishing platform. We will use either Hubspot or WordPress based technology infrastructure to connect to your marketing automation platform. Marketing automation is usually done on Infusionsoft or Active Campaign, or maybe HubSpot if you spend enough money on Hubspot. The core authority infrastructure includes your website, pillar pages on your website, your blog, your social media, search engine marketing, call to action, email marketing, landing pages, analytics, CRM and sales automation. All of this under one cohesive infrastructure and they all have to be connected and work as a concert, not in its own silo. A pillar page is a long form explainer page that includes videos, links to other resources and deep explanation of a concept. So that you can read, watch videos, and understand the concept. Why that is important – because an educated customer is a better customer. An informed customer is a better customer. In today’s day and age, everyone is going to read up and research before they buy. If you’re going to read up and research on what it is that I’m selling, I would rather you read up from me. That’s the purpose of the pillar page. Blogs are made up of blog posts. A post is 300 to 1000 words with one or two pictures and it basically draws from and connects to your pillar page. It’s important to post couple of blogs a week. If you don’t have time, energy or an ability to write that kind of content, consider hiring a blogger or a content writer who understands the HubSpot Inbound Marketing framework. What is the difference between a pillar page that has call to action versus a landing page? A landing page is independently marketed outside your website. It is campaign specific and it has the rest of the website navigation masked out. The prospect is only talking about one thing because there is nothing else on the page to distract them. To see an example of each please see – ‘eLaunchers.com’ (website) and ‘businesskamasutra.com’ (landing page). Now let’s talk about funnels. I use ClickFunnels for my funnels, but you can also build funnels in WordPress and you can also build funnels in HubSpot. I like ClickFunnels because of ease of build, I have trained people who can do this. There are funnel experts all over that we can hire. I am a ClickFunnels Certified Partner. So of all the funnel software, that happens to be the tool I prefer, but it doesn’t have to be the only tool that will work for you. The concept here is, what’s a funnel. A funnel is a pre-choreographed, pixelated journey for your prospect from one page to the next page to the next page to the next page until they finish the elongated call to action. So let’s look at Business Kamasutra. Page one is just a digital download; give me your name, email and phone number and I will email you the whole copy of my book. Page two is a Thank You Page. Thank you for requesting the download. Here is. Would you like me to ship you the book, you can buy it from Amazon for 20 bucks but on this page, I’ll sell it to you for free. Just give me five bucks to cover the shipping and I’ll send it to you. Sometimes I will switch out the free option, and put in “buy now for $10” or “buy now for $15 and pay for shipping”. So, I have tested it; free, I pay for shipping, free plus shipping – you pay for shipping or just outright pay me $10 or $15 or $20 plus shipping. These tests have shown the people who have paid full price are more likely to read the book and when they call, they’re better prospects which are better leads. I don’t get rich over someone buying a $10 book. It cost me more money in shipping and labor to actually ship the book. I’m not a very famous author; I just want people to read my book ‘Business Kamasutra’. I have another version of the book called ‘Business Kamasutra for Dentists’ and when someone buys this book, if a dentist buys this book, okay. I’d like to have a conversation. That is called indoctrination. Someone who has spent time researching you and studying you, reading your book – they are going to be a better lead. “Would you like the rest of the box?”. I’ll send you a copy of my shock and awe. I’ll give you the shock and awe formula. I’ll give you a workbook, just give me an extra $30. So, instead of paying $20, they are going to pay $50. It cost me 20 bucks to print the shock and awe and the workbook. I can no longer send it to you in an envelope, it comes in a box. So the 50 bucks actually cost me more than the $20 book that people buy. I’m not getting rich off of it. People who paid, they have demonstrated that they have made a micro commitment. And because they are vested in buying what I’m sending them, they’re more likely to read, study and talk to me. They are mentally prepared to have a meaningful conversation with me. Step two: give me a physical address. Step three is a completely separate step when I’m asking for money. When you give me money for the book there is a one-time offer for an internal up-sell and then there is a thank you page. And on thank you page there is an option, would you like to forward this to a friend: "Click here to recommend my book and my packet to your friend". So now I’m talking to two prospects at the same time. When people come to your website, homepage, interior pages, a pillar page or your blog, we want them to read, get educated and then take action. That is called a call-to-action. Usually a button, in prominent colors; red, green, blue, something sharp, something contrast and when someone clicks on that button, they’re taken to a secluded area, could be a pop up, could be a page on your website that maybe has navigation masked. It tells him to do something, take an action: buy something, buy a book, respond to a campaign, book an appointment, come on down, print this gift certificate and bring it with you. Call-to-action could be all kinds of things – whatever is appropriate for you. You want to have a button on the blog, pillar pages, at homepage that takes him to that secluded area. We want to know how many people are coming to your homepage, interior pages, pillar page, blog, landing pages, funnel and how many are taking steps to go from step, to step, to step, to step. That is called analytics and tracking. In Google Analytics we can put a Google pixel on it. (A pixel is a piece of code used track online content.) You can put Facebook pixel on it. You could put a HubSpot pixel on it so HubSpot can track who is visiting your website. If you’re hosting your website, blog and landing pages on HubSpot – everything is tracked natively. You can connect all your tracking devices to one central dashboard on databox. And then you can basically have all your analytics on your mobile phone, on your smartphone watch, your website, big screen TV in your office. But the idea is to pay attention to your numbers, all of them. So, if you have all your numbers in one place that helps. Someone who is a competent webmaster will have a heart to heart conversation about analytics. You need to know your numbers. If you have a webmaster who is not driven by numbers, he is just telling he is less techie than your staff. Get rid of him and hire someone else. Preferably hire a webmaster who understand search engine optimization for YOUR industry. I’m looking for a competent webmaster who is driven by numbers. I’m a numbers guy so I live by numbers. Magnetic Marketing Math is a foundation for numbers. Kennedy’s book number one, rule number four we talked about, there has to be measurement. Dashboard and analytics are the foundation of keeping track and figuring out what is working and what’s not working. So why is measuring so important? You don’t measure success, you want to measure failure. You want to have predetermined definitions of failure. You want to know at what point you’re going to kill the campaign and move on. About half the things you or any of your vendors do, will fail. When I take on a private client, I say ok, we’ll be working together for 1000 days; that gives me 12 quarters. Every quarter we will do a campaign. I have twelve campaigns I’ll be able to do; maybe 13, 14 or 15 depending on how smoothly things go over the period of next three years. I just don’t know which six will fail and which five or six will succeed. I’m looking for half to fail, half to succeed and three to succeed by a landslide and one or two to be the blockbuster that I can keep using it as an evergreen asset because it worked. So there needs to be a tolerance for failure and there needs to be a very vigilant, very careful look at numbers to make sure that you’re calling failure, failure and you’re calling success, lack of failure. You want to measure and monitor everything. You watch your numbers like a hawk. Leads are suspects, when they’re qualified, they become prospects. When a prospect show an interest and you’re engaged in a meaningful conversation, that’s an opportunity. You can never close a customer, you can never close a lead. You can only close an opportunity. So, it’s important to transition from marketing automation to sales automation. All of the available automation systems have a different way of running with it, but the core principle is the same. You attract someone, persuade them to become a qualified lead nurture them, engage them, persuade them to have a meaningful conversation at which point they become an opportunity. And then you follow up on the opportunity using normal sales process. Everything is Ritual. Everything has a standard operating procedure that is written and documented in an online tool that will help you make sure that you are staying on top of your game. Appointment scheduled -> quote requested -> quote submitted -> closing -> losing interest -> won – closed or lost – closed. Offer is the same thing. It’s not about the software. It’s about your own wisdom, how programmable your humans are and how well they’re using the system that was built by the CEO and the marketing strategist and the sales strategist. If you want to have a conversation with me, book a call for an hour. I will log into my own HubSpot, I will show you how your own record has gone through an entire transition: how you became a marketing qualified lead, moved to a sales qualified lead, and finally, how this conversation became an opportunity. We will even do a fictitious (or not fictitious) transaction. You will see the different sales stages, and you will see how the data is tracked, all through the process. I’ll be happy to show you how I do it if that is helpful to you. So call me at (301) 760-4940 for a free consultation today. Magnetic Marketing talks about show up with a gift, be a welcome guest, not an annoying pest and share before you sell. Magnetic Marketing talks about lead capture. Deliver the gift, that’s follow up. Ultimate Marketing Machine takes that concept further. Ultimate Marketing Machine focuses on failsafe follow up. When you compare my ‘Business Kamasutra’ for recommendations and what is in Ultimate Marketing Machine from No B.S. Inner Circle, you’ll find it’s largely the same. What I like about Ultimate Marketing Machine is it gives you a step by step training on what you should do, how you should do it, and why you should do it. So from that perspective, it is a great piece of education because it’s going to mentally prepare y have a blueprint and to build the machine. 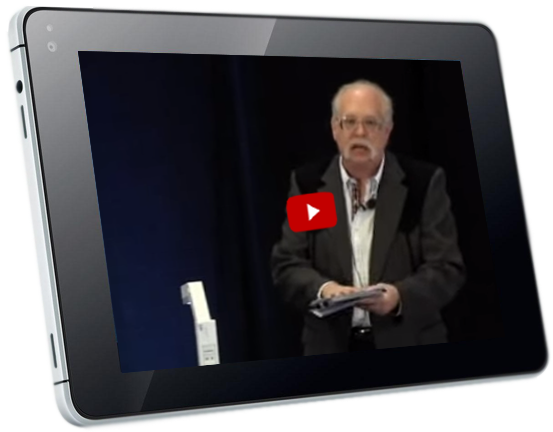 One thing Ultimate Marketing Machine talks about is your shock and awe formula. I like my shock and awe formula. We’re going to quickly talk about what goes in a shock and awe formula. This is my shock and awe packet. 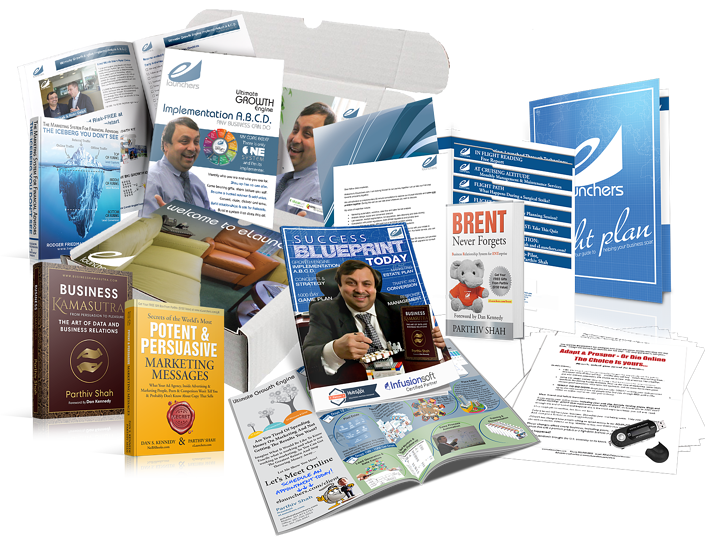 In the Shock and Awe pocket folder, on the left-hand side it has a guarantee brochure, a gift brochure that I will give you when we meet, this and this gift, but the biggest gift I will give you is 60 minutes of my life. In the middle, not in a pocket, is a sales letter and a champion later from one of my clients. Then there are seven step brochures. I’m not going to have time to describe what each element does, but if you go to eLaunchers.com/blog and search shock or shock and awe, I have a complete write up the purpose of a guarantee brochure, purpose of a gift brochure, purpose of the main sales letter, purpose of a champion letter and purpose of each one of the seven steps brochure. So please, go to eLaunchers.com/blog, search shock and awe and check them out. Almost everywhere on my website you can see “Is your shock and awe shocking and awing?” Fill out this form and I’ll ship you the shock and awe package (you could do that too, just let me know that you want it I will be happy to send this out to you). We call it our eLaunchers Wow Box. It goes to prospects, clients and referral partners has; shock and awe, it has a workbook, it has some gifts and knickknacks, it has some books that I want you to read. It's highly personalized – I use a sharpie, a silver Sharpie , to hand write, hand scribble a note on the inside of the box. Then this box goes into a priority mail box and then that entire box is delivered to you. If all I’m doing is sending you my shock and awe and one book, I will put it in a FedEx envelope. Message here is, spare no expense. Show up like no one else. You spend a ton of money to get them to raise their hand. Between now and them buying or them not buying, between now and the final decision time, it is game on. Do everything, roll everything, go all out. A No B.S. Inner Circle membership has what Adam Witty actually called a seminal work in an envelope. 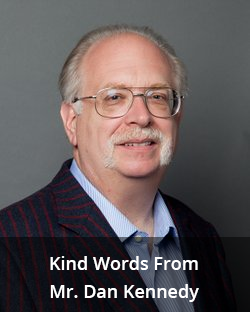 You get the ultimate wisdom from Dan Kennedy in newsletter form. When you receive it, you should, like I do, lock yourself away from distraction and study it. To me to me, this is no less precious than the Harvard Business Review and Harvard packet of case studies that we got when I was in my MBA program. Each month, these newsletters are filled with things that I learn, and I use it to make money for me and my client. I keep them in binders to refresh my memory from time to time and re-implement some choice bit of learning. You get a quarterly marketing calendar, marked up as to what day you’re going to work on what. You get a build your own marketing calendar with your daily, weekly and your quarterly marketing activities. You get a monthly e-newsletter template, on a thumb drive or a link to box.com so you have all these templates in digital format every month. You get a print newsletter template. You can repurpose your blog articles and website content by putting it in your newsletter in print. Send these to your customers, centers of influence, hot and not-so-hot prospects on a monthly basis. It reminds them you are there and keeps you top of mind when they have need of your services. You get a postcard template. Every month you send out a postcard. This can be a jumbo postcard. You could do a big postcard, 8.5 x 11 you could do a 6 by 11. You could do a 6 x 9, or you could do a 4 x 6 postcard. The idea is, a postcard that’s not in an envelope arrives at the prospect with an offer to either buy something or a call to action, read a blog or go to a pillar page. Every month you want to get in touch with them with a newsletter and a postcard. Then every month you get an idea of the month written by a marketing strategist like Dave Dee or Darcy Juarez or Dan Kennedy or the Bill Glazer. I’ve seen work from all those legends that every month you get an idea of the month that you can learn, study, implement and make some money. Some are hacks, some are full on systems, some are mindset exercises, but there is a marketing concept of the month that you can study. You also get a checklist as to what’s in the package, what are all the things that you have to do this month. All of this delivered to you either in print or digitally, depending on how you make arrangements, and this is what you get every month. This is integrated into the marketing department in a box. What are you going to do? This is going to be a lot of work. You’re going to need a crew. You’re going to need a data scientist. 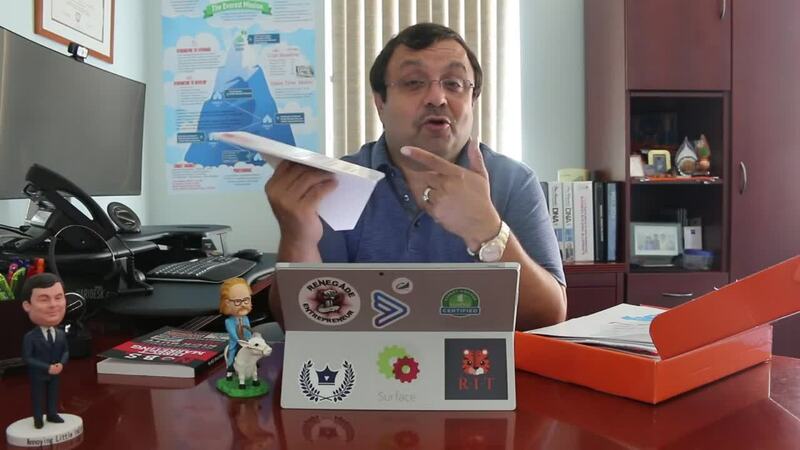 You’re going to need a marketing automation expert. You’re going to need a graphic designer who can basically take this template and customize it for you. You’re going to need a scribe who’s going to write for you. I’ll be happy to turnkey everything for you when you become a full-on agency client. We design, write, deploy, create a turnkey everything. All you have to learn is how to strategize how to work with our project managers and how to sign off on things. You don’t have to have any general contractor hiring eight vendors and coordinating a date for everybody and managing the large production dashboard. Especially for small to mid-sized businesses making $500,000 to $4 million in revenue, you may or may not have an in-house staff to manage all these things. In that case, consider working with eLaunchers or someone like me, someone who’s certified in the software of your choice. If Infusionsoft is the choice of your software hire an Infusionsoft Certified Partner you can trust. If HubSpot if your choice, hire a HubSpot Partner. Or better yet pick a partner that you trust and let them pick out your technology. Here’s some homework. Please download and read some of my e-publications. I may ask you to read a particular document on this list before our appointment. For more reading material, please request access to my study club library at www.freestudyclub.com. There are over 50,000 pages in my library. I will help you decide exactly what to read depending on your situation. Access to my study club library is FREE for my study buddies.